We accept dental emergencies and we understand how important it is to address them immediately. 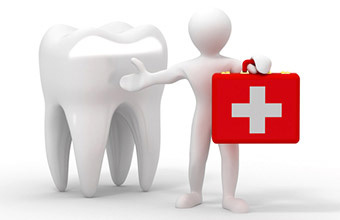 Dr. Khetani will treat dental emergencies the same day whenever possible for new and existing patients. She is also available on weekends for emergency appointments. For emergencies, call our office at 408-564-6419. 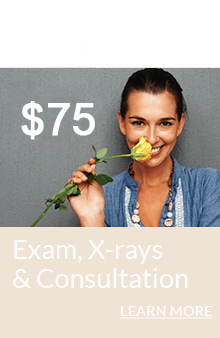 We will schedule you to see Dr. Khetani the same day if at all possible. If you reach our office after hours, just listen to the voice message and you will be given instructions on how to reach the doctor directly. When Dr. Khetani sees you, she will rapidly assess the situation and will get you out of pain as a first action regardless of what else may be needed. In many cases, she can treat the underlying problem during the same visit. 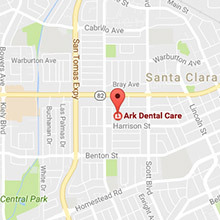 To make an appointment, call 408‑564‑6149 or click here to request an appointment online. Knocked-out tooth: Keep the tooth moist at all times. Attempt to place it back in the socket without touching the root, and bite down gently on a wet tea bag or gauze to hold it in place. If that isn’t possible, you can carry the tooth under your tongue or between your lower lip and gums. You can also place the tooth in a container and cover it with whole milk or a small amount of saliva. Knocked-out baby tooth: If your child has knocked out a baby tooth, keep the tooth moist and come to our office as soon as possible. 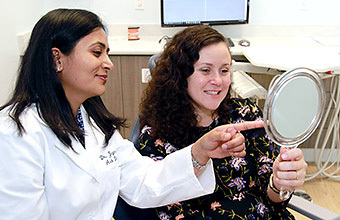 Dr. Khetani can see whether all or part of the tooth fell out, and she will determine whether it can or should be reinserted. Cracked tooth: Immediately rinse your mouth with warm water to clean the area and place cold compresses on your face to counteract possible swelling. Broken tooth: Save all pieces of the tooth that you can find, and rinse your mouth with warm water to flush out any remaining fragments. Apply a cold compress to the area. Loose crown: If a dental crown detaches, you first want to try to carefully slip it back on. To accomplish this, prepare the inside of the crown with some over-the-counter dental cement or denture adhesive. If you can’t obtain any, use toothpaste. If this does not work to hold it in place for a bit, or you have no opportunity to try, bring the crown with you to our office. Lost filling: Temporarily seal the exposed cavity with over-the-counter dental cement or some sugarless gum. Toothache: Rinse your mouth out with warm water. Use dental floss to gently remove any food particles lodged between your teeth. If any swelling has occurred, apply a cold compress to the area. Don’t put aspirin on your aching tooth or gums as it may burn your gums. Dental abscess: To ease the pain and attempt to draw the infection to the surface, rinse your mouth with a solution of ½ teaspoon salt in eight ounces of water. Do this several times a day.